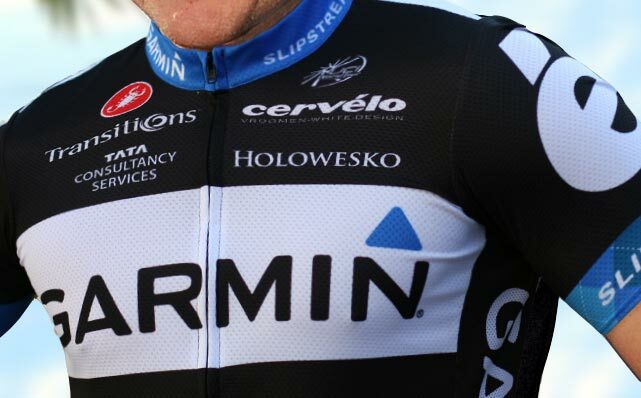 The Garmin-Cervelo team has given fans a tantalising glimpse of its 2011 team jersey in an email sent out to subscribers of its email newsletter. Garmin-Cervelo is formed from the amalgamation of two 2010 squads – Garmin-Transitions and Cervelo Test Team. Both of the squads’ previous kit has been popular among fans: Garmin’s for its argyle flavour and Cervelo for its understated black-and-white design. Discussion has been rife on the internet in recent weeks of how the new squad would combine argyle with black and white – and now we know. From the glimpse shown in the circulated picture, the kit bears more of a resemblance to Cervelo’s 2010 strip than Garmin’s – and it perhaps surprising that the bike manufacturer’s name isn’t more prominent on the jersey front. There’s no mistaking Cervelo’s distinctive ‘é’ on the shoulders, though. The blue argyle element appears to have been reduced to the collar and cuffs, and there’s no evidence of the orange colour of the former Garmin clothing. Unless, of course, the team will be wearing knee-length orange argyle socks. The ProTeam-level Garmin-Cervelo squad is registered in the USA, and includes riders from both of its parent squads. The team boasts a wealth of talented riders including Thor Hushovd, Heinrich Haussler, Tyler Farrar, Christian Vande Velde, Ryder Hesjedal, Dan Martin and Britons Roger Hammond, Daniel Lloyd and David Millar.